"A healthy grain salad with lots of fresh flavor." Rinse the quinoa thoroughly under cold water, and drain. Melt butter in a large saucepan over medium heat, and cook and stir the quinoa until the water has evaporated and the quinoa is lightly toasted, about 3 minutes. Pour in the chicken broth, bring to a boil, reduce heat to low, and simmer until the quinoa has absorbed all the broth, about 10 minutes. 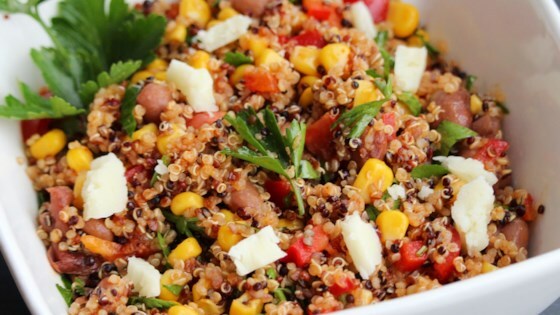 Cool quinoa in refrigerator at least 10 minutes. Mix together green pepper, red onion, corn, black beans, cilantro, tomato, lime juice, red wine vinegar, olive oil, adobo seasoning, and feta cheese in a large salad bowl. Lightly stir in the quinoa, and season with salt, pepper, and additional lime juice to taste, if desired. Chill the salad at least 30 minutes before serving; serve cold. This tasty veggie-centric meal only tastes expensive! Great Recipe! I made this for 40 people, and it was a hit! The only thing I did differently was use 1/2 chicken broth, 1/2 water to cut down on the salt a bit. Not as flavorful as I hoped that it would be. I made using Kashi pilaf and didn't use chicken broth and I thought this was great. Making it for lunch. I didn't have adobo so looked up recipe for it and made it from scratch. Loved this salad! I didn't have adobo, so I made my own (garlic powder, onion powder, oregano, cayenne). I didn't have a tomato on hand, but it was great w/out it! Yum yum yummy! I added avocado--even better!! Thanks for the recipe.